In the ongoing search for America's coffee shop, Christine and I are at Deli After Dark, aka Center Deli in Dedham. DAD caters, puts up lunch and dinner, and packs meals to take home: parms eggplant and chicken, lasagna, pasta, sausage and meatballs. It's noon, it's all men and all the men know each other. The menu's on the wall and the kitchen's open so you can watch. I don't know about you but I always watch. The chef, amiable with those he knows, signals to the new girls that they too can have anything they want. I grew up in New York where coffee shops bloom on every corner in Manhattan and Long Island. Shopping or hair cut, Mom and I are never more than steps from a BLT or egg salad with an ice cream soda. Deli after Dark's sandwich menu includes The Pilgrim (which must be a New England thing) and Super Mario, who was not yet born when I was a kid. They wrap: Buffalo chicken, Texas twister with BBQ, Honey Bee and Fitzy's Baja, like tacos with chicken. No malteds or ice cream sodas that we can see and that's okay: there are spirits. It's informal, so take yourself up to the counter, and give an order to the chef who will make it straight away. DAD's right across from where the Museum of Bad Art used to hang in the Dedham Theatre. They make everything: the turkey, the chicken, the meatballs, and the sauces. 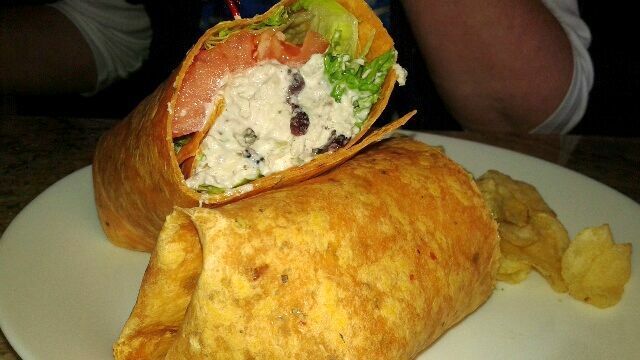 Christine is having chicken salad in a tomato basil wrap that's dressed with walnuts, Boston lettuce and spring tomato. It's generous: Creamy salad with nuts are so good together even she can't believe she eats the whole thing. This is lunch as it should be. Having rolled my way through a klatch of meatballs this year, some good, some not, today I plan to study meatballs in their element. When it's my turn, I order the meatball sandwich. I hear this: "We're out of meatballs." Really, there was a city-wide morning run on meatballs? Okay, I'll have chicken cutlet. 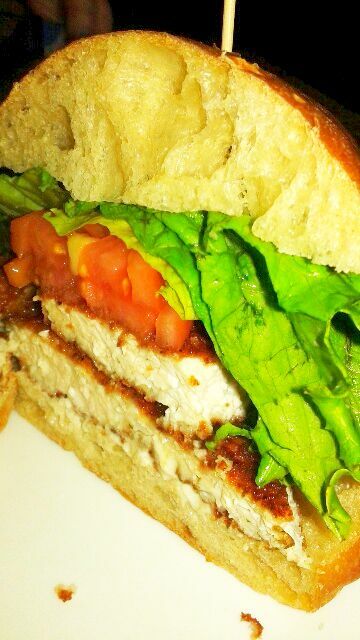 It's one to write home about: moist chicken lightly coated, a heap of lettuce and ruby tomatoes piled on ciabatta. (It turns out ciabatta was first baked only in 1976.) Yes, it's fried and yes, I eat it but not the bread. From behind the counter I see the chef who sees I didn't eat his bread. Now what? He knows meatballs but not fear of carbs. I resign myself to meatball research later. 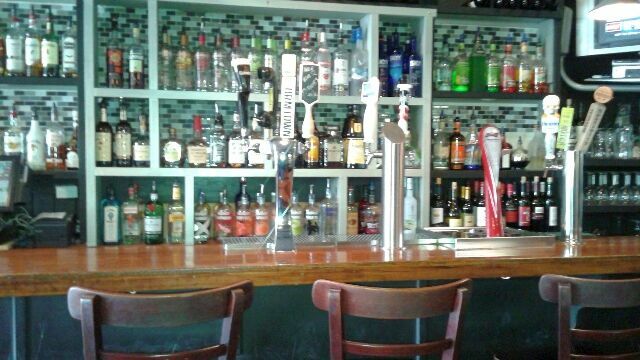 If you're here for beer alone, a six seat bar's got you covered. The evening menu allows for sandwiches but we say go with thin crust pizza: chicken, broccoli, eggplant, alfredo, ricotta, squash, brown sugar, tacos, salsa, buffalo chicken, blue cheese, cheddar cheese, mozzarella, feta cheese, Monterey jack, spinach, pesto, hamburger, sausage, pepperoni, macaroni, barbecue, pickles and pulled pork, not all at once but sometimes. Dinner: steak tips, kabobs, ravioli, parm, stir-fry, chops, clams, sausage, pasta and burgers. There are 99 beers and 40 wines. When your group needs it, you can rent the place and have a private party. 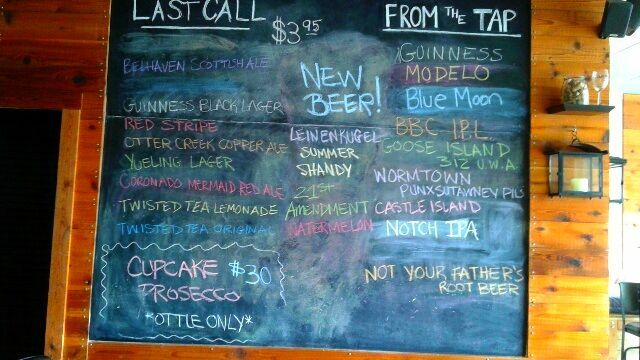 In any case, meatballs not withstanding, where there's beer, it beats coffee. No disrespect intended.